In 2010, an Arizona company called EJM Kyrene Property agreed to sell property to sell 15 industrial properties located throughout the United States for $136 million. The buyer was KTR Property Trust. One of those properties was located in Tempe, Arizona. CMBS Special Servicers – A Billion Dollar Problem? Anyone who regularly reads our Due Diligence blog knows that we are not fans of Bank of America. The bank has paid over $20 billion in fines and penalties yet continues to misbehave. It is almost as if big fines have simply become a cost of doing business. Associated Bank is back in the spotlight. 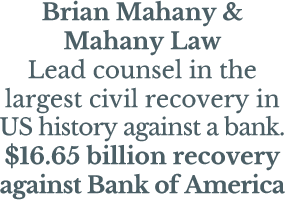 The Green Bay, Wisconsin bank has lost its second challenge against a lender liability lawsuit alleging the bank aided in a scheme defrauding 700 investors out of nearly $200 million by violating the Bank Secrecy Act and federal anti-money laundering regulations. Luckily, a court-appointed receiver continues to pursue the case and the victims could potentially recover some of their losses.